A lone American flag flew in Wilmington, N.C., on Monday, four days after Hurricane Florence slammed the city, leaving it isolated. Rochel Williams returns to her home to gather belongings on Friday after the family's front porch collapsed and roof flew off earlier in the morning as Hurricane Florence made landfall. The United States National Guard and Coast Guard, bring evacuees mostly from Brunswick and Pender county, in the K&W parking lot in Wilmington, N.C., on September 18, 2018. These evacuees come from high flooded areas where the Cape Fear River is cresting over. Patrick Russell sits in Burgaw Middle School as he seeks shelter ahead of the forecasted landfall of Hurricane Florence in Burgaw, North Carolina, USA, 12 September 2018. Abbie plays in the street that is submerged due to the overflow of the Cape Fear River caused by Hurricane Florence in Wilmington, NC, USA, September 14, 2018. People evacuate ahead of the forecasted landfall of Hurricane Florence and seek shelter at Burgaw Middle School in Burgaw, North Carolina, USA, 12 September 2018. J.R. Simons (left), homeowner of 510 Dock Street, stands with tenant Cathy Sullivin in Wilmington, North Carolina, September 15, 2018. "From my understanding this is a higher elevation part of Wilmington. And the most dangerous part of the storm would be the storm surge and that was down by the River." Sullivin said. Sullivin moved to Wilmington from Boston in 2017. People evacuate ahead of the forecasted landfall of Hurricane Florence as they seek shelter at Emma B. Trask Middle School in Wilmington, North Carolina, USA, 11 September 2018. Pets are evacuated ahead of the forecasted landfall of Hurricane Florence and seek shelter at Burgaw Middle School in Burgaw, North Carolina, USA, 12 September 2018. 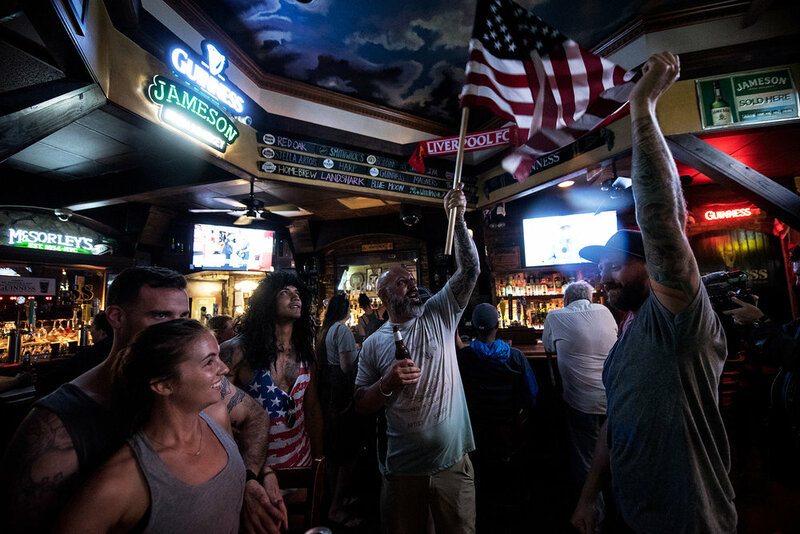 Kristin Henry (front/left), Paddy McGrave (back/left), and Jeff Egyp, react to George (center) and Andy Guiles flying the American Flag inside Slainte Irish Pub. is one of two bars open for business despite the expected landfall of Hurricane Florence in Wilmington, NC, USA, September 13, 2018. A tree is pulled from the ground and has fallen ontop of a house from Hurricane Florence in the Southside district in Wilmington, NC, USA, September 15, 2018. Jamie Moore, a homeowner, evacuate's ahead of the forecasted landfall of Hurricane Florence in Carolina Beach, North Carolina, USA, 12 September 2018.